You are a person who likes to keep fit. You maintain a fitness regime of watching your diet, and doing your cardio and weights regularly. Business trips, often characterised by tight schedules and packed itineraries, can be disruptive to your daily routine. It is tempting to treat business trips as fitness regime “cheat days”. After all, it’s just a few days, right? Well, this shouldn’t be the case! Here are 3 tips to help you maintain your health and fitness while on the go. If something is not what you would eat normally, then avoid it during the trip. Take buffet breakfast for instance. Avoid piling on the food, especially the oily stuff during breakfast. At night, resist temptation and do not raid the minibar for chips, chocolates and beer, even if it is complimentary. Instead, make sure you drink plenty of water. Water helps to ease hunger pangs and keeps you hydrated during your flight. As you travel around from meeting to meeting during the day, bring a bottle of plain water with you so that you can avoid buying sugared drinks. A can of soft drink contains around 150 calories, so can you imagine how much calories you will be consuming if you take a few of these a day? You may also want to bring along some healthy snacks on your trip. They are healthy alternatives to in-flight meals, which are often high in sodium content. Cereal bars can be an ideal choice if you avoid the ones that are laden with sugars or fat. These snacks will also come in handy when you are rushing between meetings and do not have time for a proper meal. Brisk walking is good for health. If you really think about it, there are plenty of opportunities to walk while on a business trip. At the airport, travellators help you to get to your departure gate quickly but sometimes they can be jam-packed with people. If that happens, take it as an opportunity to work your leg muscles by walking on the side to your departure gate instead – burn some calories while ensuring you catch your flight! If you’re embarking on long-haul flights, it helps to get an aisle seat so that you can easily get up and walk. While that wouldn’t help you to burn much calories, being able to stretch and move around a bit helps to prevent problems like Deep Vein Thrombosis (which can develop due to prolonged periods of immobility). Transiting in an airport and rushing for your connecting flight? Sounds like another perfect opportunity to walk or even jog to your next departure gate. On a related note, since connection times are tight, do make sure your travel insurance covers travel delay benefits! If your hotel is within walking-distance from your meeting venue, brisk walking may actually be even faster than taking a taxi. Walking can save you precious time, as well as help you to stay in shape. In addition, you get to enjoy more of the sights around your hotel and meeting venues. At your hotel and meeting venues, if it is possible, take the stairs instead of the escalator or lift for the “ultimate strength-and-cardio workout”. If your hotel is equipped with a gym, make use of the gym to get your dose of daily exercises. Otherwise, you actually have all you need for a thorough strength and flexibility workout right in your hotel room! If you are into Yoga or Pilates, all you need is some space and a carpeted floor, and you’re good to go. For strength-based exercises, leverage on sturdy chairs (or even the bed!) or your carry-on luggage to do exercises such as triceps dips, push-ups, stomach crunches and lifts. Check out this slideshow article and be inspired for a 20-minute hotel room workout. 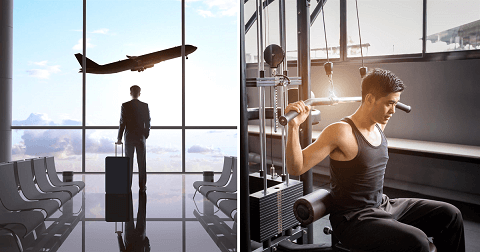 Here’s one final tip: even as we take steps to protect our fitness during our business trip, we should not forget the importance of insurance coverage. With so many different options for travel insurance out there, it is essential to choose a company whose plans are great value-for-money, places people over policies, and is renowned for hassle-free and immediate travel claims (hint: it’s Etiqa and our ePROTECT travel range of travel insurance plans). Etiqa’s ePROTECT travel insurance plans offer benefits, features and options that make it ideal for business travel (and leisure travel as well). So, if you’re looking to make an overseas trip, surf over to our website and insure your trip with ePROTECT travel. In addition, watch out for great travel insurance deals on Fridays. We wish you fruitful travels!